본 발명은 플래시 메모리 장치 장치에 관한 것이다. The present invention relates to a flash memory device unit. 플래시 메모리 장치는 멀티-비트 데이터를 저장하는 메모리 셀과, 기준 바이어스 전압을 생성하는 기준 바이어스 전압 제공 회로와, 기준 바이어스 전압을 사용하여 메모리 셀에 저장된 멀티-비트 데이터를 감지하는 감지 증폭기와, 그리고 기준 바이어스 전압 제공 회로를 제어하는 제어 회로를 포함하며, 제어 회로는 읽기 동작 시 메모리 셀에 인가되는 메인 워드 라인 전압의 변화에 따라 기준 바이어스 전압이 디벨로프되도록 기준 바이어스 전압 제공 회로를 제어하는 플래시 메모리 장치. The flash memory device is a multi-memory cell to store a bit of data, based on the reference bias voltage providing circuit for generating a bias voltage, with the reference bias voltage to a multi-stored in the memory cells and sensing to detect the bit data amplifier, and and a control circuit for controlling the base bias voltage providing circuit, the control circuit is a flash for controlling a reference bias voltage providing circuit to the reference bias voltage to the rope Development in accordance with the change of the main word line voltage applied to the read operation when memory cell memory Device. 본 발명은 반도체 메모리 장치에 관한 것으로, 특히 플래시 메모리 장치에 관한 것이다. The present invention relates to a semiconductor memory device, in particular a flash memory device. 반도체 메모리 장치(semiconductor memory device)는 데이터를 저장해 두고 필요할 때 꺼내어 읽어볼 수 있는 기억장치이다. A semiconductor memory device (semiconductor memory device) is a storage device that can read the data stored is taken out when needed leave. 반도체 메모리 장치는 크게 램(Random Access Memory; RAM)과 롬(Read Only Memory; ROM)으로 나눌 수 있다. The semiconductor memory device largely RAM can be divided into;; (ROM Read Only Memory) (Random Access Memory RAM) and ROM. 램(RAM)은 전원이 끊어지면 저장된 데이터가 소멸하는 휘발성 메모리 장치(volatile memory device)이다. Random access memory (RAM) is a volatile memory device (volatile memory device) that the power is disconnected when the stored data is extinguished. 롬(ROM)은 전원이 끊어지더라도 저장된 데이터가 소멸하지 않는 불휘발성 메모리(nonvolatile memory device)이다. Read-only memory (ROM) is a non-volatile memory (nonvolatile memory device), the data is stored even if the power is cut off does not disappear. 램(RAM)은DRAM(Dynamic RAM), SRAM(Static RAM) 등을 포함한다. Random access memory (RAM), and the like are DRAM (Dynamic RAM), SRAM (Static RAM). 롬(ROM)은PROM(Programmable ROM), EPROM(Erasable PROM), EEPROM(Electrically EPROM), 플래시 메모리 장치(flash memory device) 등을 포함한다. The read-only memory (ROM) comprises a PROM (Programmable ROM), EPROM (Erasable PROM), EEPROM (Electrically EPROM), a flash memory device (flash memory device) or the like. 플래시 메모리 장치는 일반적으로 낸드형과 노어형으로 구분된다. Flash memory devices are typically separated by a NAND and NOR. 노어 플래시 메모리 장치는 코드 저장형 메모리 장치로서, 낸드 플래시 메모리 장치에 비해 동작 속도가 빠르기 때문에 고속 데이터 처리가 필수적인 이동전화 단말기 등에 주로 사용된다. NOR flash memory device is mainly used for code storage type as a memory device, a NAND flash memory device, because compared to the faster the operation speed is the high speed mobile data processing integral phone handset. 한편, 멀티 레벨 셀(Multi-Level Cell)은 하나의 메모리 셀에 2 비트 이상의 데이터가 저장되는 멀티 비트 셀이다. On the other hand, multi-level cell (Multi-Level Cell) is a multibit cell that is at least two bits in one memory cell, data is stored. 프로그램 상태 또는 소거 상태를 갖는 단일 레벨 셀과는 달리, 멀티 레벨 셀은 하나의 메모리 셀을 가지고 2 비트 이상의 데이터를 나타낼 수 있다. Unlike the single-level cell having a program state or an erased state, multi-level cell may represent a more than 2-bit data with one memory cell. 플래시 메모리 장치는 메모리 셀에 저장된 멀티-비트 데이터를 읽기 위해서, 감지 증폭기(Sense Amplifier)를 사용한다. The flash memory device is stored in the multi-memory cells to read the bit data and uses sense amplifiers (Sense Amplifier). 감지 증폭기는 선택된 메모리 셀을 통해 흐르는 전류의 양을 기준 전류와 비교함으로서 선택된 메모리 셀에 저장된 데이터를 감지한다. 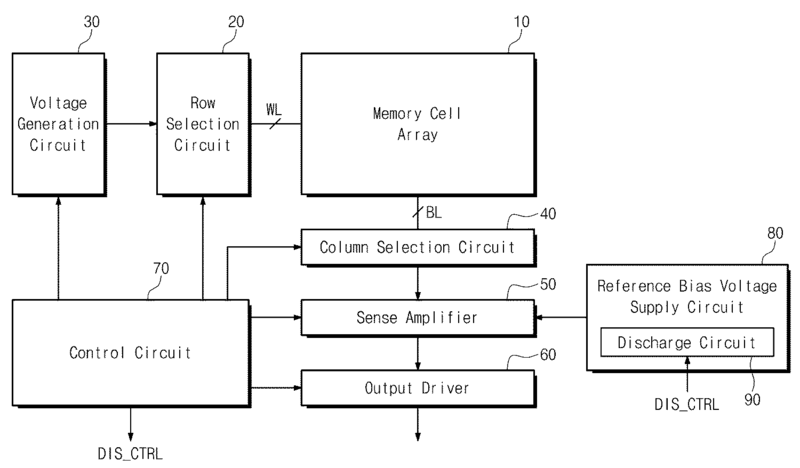 The sense amplifier senses the data stored in the selected memory cell by comparing the reference current with the current flowing through the selected memory cell. 기준 전류를 생성하기 위해서 플래시 메모리 장치는 기준 메모리 셀을 구비한다. In order to generate a reference current to the flash memory device it is provided with a reference memory cell. 멀티 레벨 셀의 상태를 읽기 위해서 플래시 메모리 장치는 메모리 셀에 인가되는 워드 라인 전압을 순차적으로 증가한다. To read the state of the multi-level cell flash memory device increases the word line voltage applied to the memory cells in order. 플래시 메모리 장치는 선택된 메모리 셀에 저장된 데이터를 감지하기 위해서 선택된 메모리 셀과 기준 메모리 셀 각각에 워드 라인 전압을 인가한다. Flash memory device is applied to a selected memory cell and the word line voltage to a reference memory cell respectively to sense the data stored in the selected memory cell. 여기서 메모리 셀에 인가되는 워드 라인 전압을 메인 워드 라인 전압이라 칭하기로 하고, 기준 메모리 셀에 인가되는 워드 라인 전압을 기준 워드 라인 전압이라 칭하기로 한다. As here referred to as a main word line voltage to the word line voltage applied to the memory cell, and a word line voltage applied to the reference memory cell, will be referred to as a reference word line voltage. 플래시 메모리 장치에서 메인 워드 라인 전압은 순차적으로 증가되는데 반하여 기준 워드 라인 전압은 한번 증가된 이후에 일정한 전압으로 유지된다. Main word line voltage in a flash memory device, whereas there is sequentially increased based on the word line voltage is maintained at a constant voltage after the once increased. 플래시 메모리 장치에서 멀티 레벨 셀을 읽는 경우 메인 워드 라인 전압이 증가되는 시구간 즉, 디벨로프(develop) 구간이 존재한다. When reading the multi-level cell flash memory device in the present time interval in which the main word line voltage increases that is, Development rope (develop) interval. 읽기 동작 시 플래시 메모리 장치는 메인 워드 라인 전압의 디벨로프 구간 이후 메인 워드 라인 전압이 일정한 전압으 로 유지되는 구간에서 메모리 셀에 저장된 데이터를 감지한다. Read operation when the flash memory device to detect the data stored in the memory cell in the section is maintained in the rope developmental period after the main word line voltage to a constant voltage of the main word line voltage. 본 발명은 상술한 기술적 과제를 해결하기 위해 제안된 것으로, 본 발명의 목적은 읽기 속도를 향상시키는 플래시 메모리 장치에 관한 것이다. The present invention has been proposed in order to solve the above technical problem, an object of the present invention relates to a flash memory apparatus for improving the read speed. 본 발명에 따른 플래시 메모리 장치는 멀티-비트 데이터를 저장하는 메모리 셀, 기준 바이어스 전압을 생성하는 기준 바이어스 전압 제공 회로, 기준 바이어스 전압을 사용하여 상기 메모리 셀에 저장된 멀티-비트 데이터를 감지하는 감지 증폭기, 및 상기 기준 바이어스 전압 제공 회로를 제어하는 제어 회로를 포함하며, 상기 제어 회로는 읽기 동작 시 상기 메모리 셀에 인가되는 메인 워드 라인 전압의 변화에 따라 상기 기준 바이어스 전압이 디벨로프되도록 상기 기준 바이어스 전압 제공 회로를 제어한다. The flash memory device according to the invention is a multi-standard bias voltage providing circuit for generating a memory cell, the reference bias voltage to store a bit data, by using the reference bias voltage to a multi-stored in the memory cells, which detect the bit data sense amplifiers , and a control circuit for controlling the reference bias voltage providing circuit, the control circuit is a read operation when the response to changes of the main word line voltage applied to the memory cell bias the reference so that the reference bias voltage rope Development voltage and it controls the service circuit. 이 실시예에 있어서, 상기 읽기 동작은 복수의 인에이블 구간들을 포함하고, 상기 각 인에이블 구간 동안 상기 메모리 셀로 메인 워드 라인 전압이 공급되며, 상기 인에이블 구간들 중 적어도 하나는 디스차지 구간을 포함한다. In this embodiment, the read operation is comprising a plurality of the enable interval, and wherein the memory cell main word line voltage supply for each of the enable interval, and at least one of the enable interval comprises a discharge section do. 이 실시예에 있어서, 상기 디스차지 구간 동안, 상기 제어 회로는 상기 기준 바이어스 전압이 소정 레벨까지 방전되도록 상기 기준 바이어스 전압 제공 회로를 제어한다. In this embodiment, the discharge during the interval, the control circuit controls the reference bias voltage providing circuit to the reference bias voltage is discharged to a predetermined level. 이 실시예에 있어서, 상기 읽기 동작은 제 1 내지 제 3 인에이블 구간들을 포함하고, 상기 제 1 및 제 2 인에이블 구간들 각각은 상기 디스차지 구간을 포함한다. In this embodiment, the read operation are respectively the first to third enable interval and wherein the first and second enable intervals of comprises said discharge segment. 이 실시예에 있어서, 상기 방전된 기준 바이어스 전압은 상기 디스차지 구간이 종료된 후 다음의 인에이블 구간에서 상기 메인 워드 라인의 변화에 따라 증가된다. In this embodiment, the reference bias voltage of the discharge is increased with the change of the main word line in an enabled period of the discharge interval, and then after the ends. 상기 기준 메모리 셀의 게이트로 기준 워드 라인 전압을 제공하는 기준 워드 라인 전압 제공 회로; Based on the word line voltage providing circuit for providing a reference word line voltage to a gate of the reference memory cell; 및 상기 기준 메모리 셀의 드레인에 연결되고, 상기 기준 바이어스 전압을 생성하는 기준 바이어스 전압 생성 회로를 포함하고, 상기 기준 워드 라인 전압 제공 회로는 상기 기준 워드 라인 전압을 상기 디스차지 구간 동안 디스차지하도록 구성된 디스차지 회로를 포함하며, 상기 기준 바이어스 전압은 상기 기준 워드 라인 전압의 변화에 따라 변화된다. And is connected to the drain of the reference memory cell, a reference bias includes a voltage generation circuit to provide the reference wordline voltage circuit for generating the reference bias voltage is configured to charge discharge during the discharge period of the reference word line voltage It includes a discharge circuit, the reference bias voltage is changed according to the change of the reference word line voltage. 이 실시예에 있어서, 상기 기준 바이어스 전압 제공 회로는 기준 메모리 셀, 상기 기준 메모리 셀의 게이트로 기준 워드 라인 전압을 제공하는 기준 워드 라인 전압 제공 회로, 및 상기 기준 메모리 셀의 드레인에 연결되고, 상기 기준 바이어스 전압을 생성하는 기준 바이어스 전압 생성 회로를 포함하고, 상기 기준 바이어스 전압 생성 회로는 상기 기준 바이어스 전압을 상기 디스차지 구간 동안 디스차지하도록 구성된 디스차지 회로를 포함한다. In this embodiment, the reference bias voltage providing circuit is connected to the reference memory cell, the drain of the reference memory based on the word line voltage to provide a reference word line voltage to a gate of the cell providing circuit, and said reference memory cells, the reference includes a bias reference voltage to a bias voltage generator for generating a circuit, and the reference bias voltage generating circuit includes a discharge circuit configured to discharge charge during the discharge interval of the reference bias voltage. 본 발명에 의하면, 메인 워드 라인 전압의 디벨로프 구간에서 메인 워드 라 인 전압과 함께 변화되도록 기준 메모리 셀로부터 발생되는 기준 바이어스 전압을 제어함으로써, 플래시 메모리 장치의 읽기 속도를 향상시킬 수 있다. According to the present invention, by controlling the bias reference voltage generated from the reference memory cell to be changed with the voltage in the main word la Development rope section of the main word line voltage, it is possible to improve the reading speed of a flash memory device. 이하, 본 발명에 따른 바람직한 실시예를 첨부한 도면을 참조하여 상세히 설명한다. With reference to the accompanying drawings a preferred embodiment according to the present invention will be described in detail. 하기의 설명에서는 본 발명에 따른 동작을 이해하는데 필요한 부분만이 설명되며 그 이외 부분의 설명은 본 발명의 요지를 흩트리지 않도록 생략될 것이라는 것을 유의하여야 한다. DETAILED DESCRIPTION OF THE necessary for understanding the operations according to the present invention is to be noted that description of the other parts will be omitted so as ridges heutteu the subject matter of the present invention. 본 발명은 플래시 메모리 장치 중 하나인 노어 플래시 메모리 장치를 일예로 설명하기로 한다. The invention will be explained, one of the NOR flash memory device of the flash memory device as an example. 노어 플래시 메모리 장치는 적은 면적으로 큰 용량을 얻기 위해서 하나의 메모리 셀에 멀티-비트 데이터(multi-bit data)를 저장하는 기술을 채용하고 있다. NOR flash memory device is a multi-in one memory cell in order to obtain a large capacity with a small area-is employed a technique for storing bit data (multi-bit data). 본 발명은 셀 당 다수 비트의 데이터를 저장할 수 있는 노어 플래시 메모리 장치를 이용하여 설명될 것이다. The invention will now be described with reference to the NOR flash memory device that can store data of a number of bits per cell. 도 1은 본 발명의 실시예에 따른 메모리 셀들의 분포를 도시한 도면이다. 1 is a view showing the distribution of the memory cells according to an embodiment of the invention. 도 1을 참조하면, 문턱전압에 따른 메모리 셀들의 분포가 도시되어 있다. Referring to Figure 1, there is a distribution of memory cells according to the threshold voltage is shown. 메모리 셀은 문턱 전압에 따라 4개의 상태들(11, 10, 01, 00) 중에서 어느 하나의 상태를 갖는다. Memory cell has a state of either one among the four states (11, 10, 01, 00) depending on the threshold voltage. 메모리 셀의 상태를 읽기 위해서 노어 플래시 메모리 장치는 메모리 셀에 인가되는 워드 라인 전압을 순차적으로 증가하면서 메모리 셀의 상태를 읽는다. NOR flash memory device to read the state of the memory cell while increasing the word line voltage applied to the memory cell in order to read the state of the memory cell. 예를 들어, 제 1 워드 라인 전압(R1)이 메모리 셀에 인가된 상태에서 메모리 셀이 온 상태로 판별되면, 그 메모리 셀은 '11' 상태에 있다. For example, if the first word line voltage (R1) is determined from the applied state to the memory cells in the memory cell is turned on, the memory cell is in the "11" state. 제 1 워드 라인 전압(R1)이 메모리 셀에 인가된 상태에서 메모리 셀이 오프 상태로 판별되고, 제 2 워드 라인 전 압(R2)이 메모리 셀에 인가된 상태에서 메모리 셀이 온 상태로 판별되면, 그 메모리 셀은 '10' 상태에 있다. First when the memory cells in the applied state on the first word line voltage (R1) a memory cell is determined to be the OFF state, the second word line voltage (R2) is in the applied state to the memory cells the memory cell is determined to be the ON state , the memory cell is in the "10" state. 제 2 워드 라인 전압(R2)이 메모리 셀에 인가된 상태에서 메모리 셀이 오프 상태로 판별되고, 제 2 워드 라인 전압(R2) 보다 높은 제 3 워드 라인 전압(R3)이 인가된 상태에서 메모리 셀이 온 상태로 판별되면, 그 메모리 셀은 '01' 상태에 있다. The second word line voltage (R2) is in the applied state to the memory cells of memory cell is determined to be off-state, high third word line voltage (R3) the memory cells in the state is applied than the second word line voltage (R2) If it is determined in the oN state, the memory cell is in the "01" state. 그리고 제 3 워드 라인 전압(R3)이 인가된 상태에서 메모리 셀이 오프 상태로 판별되면, 그 메모리 셀은 '00' 상태에 있다. And when the third word line voltage (R3) is applied to the state the memory cell is determined to be in the OFF state, the memory cell is in the "00" state. 워드 라인 전압들(R1, R2, R3) 간에는 일정 크기의 전압 차이가 존재한다. The voltage difference of a predetermined size between the word line voltage (R1, R2, R3) is present. 읽기 동작은 복수의 워드 라인 인에이블 구간들을 포함하며, 각 워드 라인 전압 인에이블 구간에서 대응하는 워드라인 전압이 메모리 셀에 인가된다. Read operation includes a plurality of word line enable period, the word line voltage corresponding to each word line voltage to an enabled period is applied to the memory cell. 여기서, 워드 라인 전압 인에이블 구간은 디벨로프 구간을 포함한다. Here, the word line voltage to the enable interval comprises Development rope section. 디벨로프 구간은 워드라인 전압이 증가되는 구간(예를 들면, 전압 상승 구간)이며, 디벨로프 구간 동안 워드 라인 전압은 각 워드 라인 인에이블 구간의 요구되는 레벨까지 증가된다. Development rope section is the word line voltage during the period in which increases the word line voltage (e.g., voltage rising period), and developmental rope interval is increased to a level required for each word line enable period. 도 2는 본 발명의 실시예에 따른 노어 플래시 메모리 장치의 구조를 도시한 도면이다. 2 is a view showing the structure of a NOR flash memory device according to an embodiment of the invention. 도 2를 참조하면, 노어 플래시 메모리 장치는 메모리 셀 어레이(memory cell array)(10), 행 선택 회로(column selection circuit)(20), 전압 발생 회로(voltage generation circuit)(30), 열 선택 회로(row selection circuit)(40), 감지 증폭기(sense amplifier)(50), 출력 드라이버(output driver)(60), 제어 회로(control circuit)(70), 및 기준 바이어스 전압 제공 회로(reference voltage supply circuit)(80)를 포함한다. 2, the NOR flash memory device has a memory cell array (memory cell array) (10), a row selection circuit (column selection circuit) (20), voltage generation circuit (voltage generation circuit) (30), column selection circuit (row selection circuit) (40), a sense amplifier (sense amplifier) ​​(50), an output driver (output driver) (60), a control circuit (control circuit) (70), and a reference bias voltage providing circuit (reference voltage supply circuit ) and a 80. 기준 바이어스 전압 제공 회로(80)는 디스차지 회로(90)를 포함한다. Based on the bias voltage providing circuit 80 includes a discharge circuit 90. 메모리 셀 어레이(10)는 행들 및 열들의 교차 영역에 배열된 복수의 메모리 셀들을 포함한다. The memory cell array 10 includes a plurality of memory cells arranged in the intersection area of ​​rows and columns. 행 선택 회로(20)는 제어 회로(70)에 의해서 제어되며, 외부에서 제공된 행 어드레스 정보에 응답하여 메모리 셀 어레이(10)의 행들 중 한 행을 선택한다. A row selection circuit 20 is controlled by the control circuit 70, in response to the row address information provided from the external to select one row of the rows of the memory cell array 10. 또한, 행 선택 회로(20)는 전압 발생 회로(30)에서 발생된 워드 라인 전압을 선택된 워드 라인으로 인가한다. Also, the row selection circuit 20 is applied to the word line voltage generated in the voltage generating circuit 30 to the selected word line. 여기서 메모리 셀 어레이(10)의 행들 중 한 행에 인가되는 워드 라인 전압 즉, 메모리 셀에 인가되는 워드 라인 전압을 메인 워드 라인 전압이라 칭하기로 한다. Wherein the word line voltage applied to a row of the rows of the memory cell array 10, that is, it will be referred to as a main word line voltage to the word line voltage applied to the memory cell. 열 선택 회로(40)는 제어 회로(70)에 의해서 제어되며, 외부에서 제공된 열 어드레스 정보에 응답하여 메모리 셀 어레이(10)의 열들을 선택한다. Column selection circuit 40 is controlled by a control circuit 70, in response to the column address information supplied from the outside and select the columns of memory cell array 10. 감지 증폭기(50)는 제어 회로(70)에 의해서 제어되며, 행 선택 회로(20)와 열 선택 회로(30)에 의해 선택된 메모리 셀에 저장된 데이터를 감지 증폭한다. The sense amplifier 50 is controlled by a control circuit 70, the sense amplifier the data stored in the memory cell selected by the row select circuit 20 and column select circuit 30. 일반적으로 감지 증폭기(50)는 읽기 동작 시 선택된 메모리 셀에 흐르는 전류의 양을 기준 전류와 비교함으로서 선택된 메모리 셀에 저장된 데이터를 감지한다. In general, sense amplifier 50 senses the data stored in the selected memory cell by comparing the amount of current flowing through the selected memory cell during a read operation with reference current. 출력 드라이버(60)는 제어 회로에 의해서 제어되며, 읽기 동작 시 감지 증폭기(50)에 의해 감지된 데이터를 출력한다. The output driver 60 is controlled by a control circuit, and outputs the data sensed by the sense amplifier during a read operation (50). 기준 바이어스 전압 제공 회로(80)는 기준 메모리 셀을 포함한다. Based on the bias voltage providing circuit 80 includes a reference memory cell. 기준 바이어스 전압 제공 회로(80)는 기준 메모리 셀에 워드 라인 전압을 인가하여 기준 바이어스 전압을 생성한다. Based on the bias voltage providing circuit (80) by applying a word line voltage to a reference memory cell generating a reference bias voltage. 여기서 기준 메모리 셀에 인가되는 워드 라인 전압을 기 준 워드 라인 전압이라 칭하기로 한다. Here, the reference will be referred to as a quasi-word line voltage group the word line voltage applied to the memory cell. 기준 바이어스 전압 제공 회로(80)에서 생성된 기준 바이어스 전압은 감지 증폭기(50)에 입력되며, 메모리 셀에 저장된 데이터 감지할 때 기준 바이어스 전압에 응답하여 기준 전류를 생성한다. Based on the bias voltage generated by the reference bias voltage providing circuit (80) is input to the sense amplifier 50, and generates a reference current in response to a reference bias voltage when the detected data stored in the memory cell. 기준 바이어스 전압 제공 회로(80)는 읽기 동작 시 디벨로프 구간에서 센싱 가능한 기준 바이어스 전압을 생성한다. Based on the bias voltage providing circuit (80) produces a sense possible reference bias voltage from the rope developmental period when the read operation. 기준 바이어스 전압 제공 회로(80)는 디스차지 구간에서 미리 설정된 레벨로 디스차지되도록 기준 바이어스 전압을 제어한다. Based on the bias voltage providing circuit (80) controls the reference bias voltage such that the discharge to a predetermined level in the discharge period. 디스차지 구간은 메인 워드 라인 전압의 인에이블 구간 중에서 래치가 끝나는 시점부터 다음 메인 워드 라인 전압의 인에이블 구간의 시작점까지이다. Discharge interval is the time from the end of the latch from an enabled period of the main word line voltage, and then to the starting point of an enable interval of the main word line voltage. 디스차지 구간을 통해서 기준 바이어스 전압은 메인 워드 라인 전압의 디벨로프 구간에서 메인 워드 라인 전압과 동일한 전압 기울기를 갖는다. Based on the bias voltage through the discharge region has the same voltage gradient and main word line voltage on the Development rope section of the main word line voltage. 이는 디벨로프 구간에서도 감지 증폭기를 통해 메모리 셀의 상태를 감지하는 것이 가능함을 의미한다. This means that it is possible to detect the state of the memory cells via the sense amplifier section in the Development rope. 기준 바이어스 전압 제공 회로(80)는 기준 바이어스 전압을 디스차지되도록 하는 디스차지 회로(90)를 포함한다. Based on the bias voltage providing circuit 80 includes a discharge circuit 90 to discharge to take the reference bias voltage. 디스차지 회로(90)는 기준 바이어스 전압 또는 기준 워드 라인 전압 중 하나를 디스차지한다. The discharge circuit (90) occupies one of the discharge voltage reference bias voltage or the reference word line. 제어 회로(70)는 노어 플래시 메모리 장치의 프로그램, 소거, 및 읽기 동작과 관련된 제반 동작들을 제어한다. Control circuit 70 controls the overall operation related to the program, erase, and read operation of the NOR flash memory device. 디스차지 회로(80)의 디스차지 동작을 제어하기 위해서 디스차지 제어 신호(DIS_CTRL)를 발생한다. In order to control the discharge operation of the discharge circuit 80 generates a discharge control signal (DIS_CTRL). 감지 증폭기(50)는 기준 바이어스 전압 제공 회로(80)를 통해 제공되는 기준 바이어스 전압을 사용하여 감지 동작한다. The sense amplifier 50 motion detection using the reference bias voltage provided by a reference bias voltage providing circuit (80). 도 3은 도 2에 예시적으로 도시된 기준 바이어스 전압 제공 회로의 구조를 도시한 도면이다. Figure 3 is a diagram showing a structure of a reference bias voltage providing circuit illustratively shown in FIG. 도 3을 참조하면, 기준 바이어스 전압 제공 회로(80)는 기준 워드 라인 전압 생성 회로(81), 기준 메모리 셀(83), 및 기준 바이어스 전압 생성 회로(85)를 포함한다. 3, the reference bias voltage providing circuit 80 includes a reference word line voltage generation circuit 81, a reference memory cell (83), and a reference bias-voltage generating circuit 85. 기준 메모리 셀(83)의 게이트는 기준 워드 라인 전압 생성 회로(81)에 연결되고, 기준 메모리 셀(83)의 드레인은 기준 바이어스 전압 생성 회로(85)에 연결되고, 기준 메모리 셀(83)의 소스는 접지된다. A reference memory cell 83, the gate is based on the word line voltage generator is coupled to the circuit 81, the drain of the reference memory cell 83 is connected to a reference bias-voltage generating circuit 85, a reference memory cell 83 of the the source is grounded. 기준 메모리 셀(83)은 메인 워드 라인 전압들(R1, R2, R3) 중 하나에 해당하는 기준 워드 라인 전압이 인가된다. A reference memory cell 83 is the reference word line voltage corresponding to one of the main word line voltage (R1, R2, R3) is applied. 기준 워드 라인 전압 생성 회로(81)는 디스차지 회로(90)를 포함한다. Based on the word line voltage generating circuit 81 includes a discharge circuit 90. 디스차지 회로(90)는 디스차지 제어 신호(DIS_CTRL)에 응답하여 동작하며, 기준 워드 라인 전압 생성 회로(81)를 통해 생성된 기준 워드 라인 전압을 디스차지 구간에서 디스차지한다. The discharge circuit 90 is operative in response to discharge control signals (DIS_CTRL), make up the display the reference wordline voltage generated by the reference wordline voltage generation circuit 81 in the discharge zone. 디스차지 회로(90)는 기준 워드 라인 전압을 미리 설정된 전압 레벨까지 디스차지한다. The discharge circuit 90 makes up discharge to a reference word line voltage to a predetermined voltage level. 한편, 디스차지 구간이 종료되면, 즉 다음 워드 라인 전압 인에이블 구간이 시작되면, 디스차지된 기준 워드 라인 전압은 증가하게 된다. On the other hand, if the discharge period has ended, that is, when the word line voltage, and then an enabled period begins, the reference word line voltage up discharge is increased. 기준 워드 라인 전압 생성회로(81)에서 생성된 기준 워드 라인 전압은 기준 메모리 셀(83)의 게이트로 출력한다. The reference word line voltage generated in the reference word line voltage generation circuit 81 is outputted to the gate of the reference memory cell (83). 기준 바이어스 전압 생성 회로(85)는 기준 메모리 셀(83)의 드레인에 연결되 어 기준 바이어스 전압을 생성한다. Based on the bias voltage generation circuit 85 generates a reference bias voltage control is connected to the drain of the reference memory cell (83). 기준 워드 라인 전압과 같이, 기준 바이어스 전압은 기준 워드 라인 전압의 변화에 따라서 디스차지 구간과 디벨로프 구간을 통해 변화한다. Reference, such as the word line voltage, the reference bias voltage is changed through the discharge section and Development rope interval according to a change of the word line voltage. 즉, 기준 바이어스 전압은 디스차지 구간에서 미리 설정된 전압 레벨까지 낮아지고 디벨로프 구간 동안 목표 레벨까지 증가된다. That is, the reference bias voltage is lowered in the discharge section to a predetermined voltage level is increased to a target level for a developmental rope section. 도 4는 도 3에 예시적으로 도시된 기준 바이어스 전압 제공 회로의 사용에 따른 전압 파형을 도시한 도면이다. 4 is a diagram showing the voltage waveforms associated with the use of the reference bias voltage providing circuit illustratively shown in FIG. 도 4에는 메인 워드 라인 전압, 기준 워드 라인 전압, 및 기준 바이어스 전압이 도시되어 있다. Figure 4 shows the main word line voltage, the reference word line voltage, and the reference bias voltage is shown. 메인 워드 라인 전압은 메모리 셀 어레이 내에 포함된 메모리 셀의 워드 라인에 인가되는 워드 라인 전압이다. Main word line voltage is a word line voltage applied to the word lines of the memory cells included in the memory cell array. 기준 워드 라인 전압은 기준 바이어스 전압 생성 회로(85)에 포함된 기준 메모리 셀(83)에 인가되는 워드 라인 전압이다. Based on the word line voltage is a word line voltage applied to the reference memory cell (83) included in the reference-bias-voltage generating circuit 85. 한편, 기준 바이어스 전압은 기준 워드 라인 전압에 의해서 제어되는 기준 메모리 셀(83)을 통해 흐르는 전류를 사용하여 생성된다. On the other hand, the reference bias voltage is generated by using the electric current flowing through the reference memory cell 83 is controlled by a reference word line voltage. 기준 바이어스 전압은 메모리 셀의 상태를 감지하기 위해서 감지 증폭기에 제공되는 전압이다. Based on the bias voltage is a voltage provided to the sense amplifier to sense the state of the memory cell. 'a' 구간은 워드 라인 전압의 프리차지 구간이다. 'A' period is a precharge period of the word line voltage. 프리차지 구간에서 메인 워드 라인과 기준 워드 라인은 메인 워드 라인 전압, 및 기준 워드 라인 전압으로 각각 프리차지된다. Pre-charge period in the main word lines and the reference word line is pre-occupied with each main word line voltage, and the reference word line voltage. 'a' 구간에서 기준 워드 라인 전압 생성 회로(81)는 기준 워드 라인 전압으로 기준 워드 라인을 프리차지한다. 'A' based on the word line voltage generator in an interval circuit 81 are precharged to the reference word line by word line voltage. 또한, 기준 워드 라인 전압의 프리차지에 따라서 기준 바이어스 전압 생성 회로(85)를 통해 기준 바이어스 전압이 감지 증폭기에 제공된다. In addition, the reference bias voltage is generated based on the bias voltage through a circuit 85 according to the pre-charging of the reference word line voltage is provided to the sense amplifier. 'b(b1, b2, b3)' 구간은 감지 증폭기의 데이터 감지 구간 즉, 읽기 동작 구간이다. 'B (b1, b2, b3)' data interval detection period of the sense amplifier that is, the read operation period. 데이터 감지 구간은 메인 워드 라인의 디벨로프 구간을 포함한다. Data detection section includes a developmental rope section of the main word line. 일예로, 'b2' 구간에서 디벨로프 구간은 메인 워드 라인 전압이 제 1 메인 워드 라인 전압(R1)으로부터 제 2 메인 워드 라인 전압(R2)으로 증가되는 구간이다. As an example, the rope developmental sectors in the 'b2' section is a section where the main word line voltage is increased to the first main word line voltage to the second main word line voltage (R2) from the (R1). 'b' 구간에서 기준 워드 라인 전압 생성 회로(81)는 기준 워드 라인 전압을 미리 설정된 기준 워드 라인 전압으로 상승시킨다. 'B' based on the word line voltage generator in an interval circuit 81 raises word line voltage is set based on the reference wordline voltage in advance. 'b1' 구간에서 기준 워드 라인 전압 생성 회로(81)는 일정 레벨의 전압으로 프리차지된 전압을 미리 설정된 기준 워드 라인 전압으로 증가시킨다. Based on the word line voltages generated by the 'b1' interval circuit 81 increases by a predetermined word line voltage to a precharge voltage to a voltage of a predetermined level. 'b1' 구간에서 기준 바이어스 전압 생성 회로(85)는 기준 워드 라인 전압의 변화에 따라 일정 레벨로 프리차지된 전압을 미리 설정된 기준 바이어스 전압으로 증가시킨다. 'B1' bias reference voltage generation circuit 85 in the interval is increased by the bias voltage is set to the precharge voltage at a constant level according to a change in the reference word line voltage in advance. 'b2' 구간과 'b3' 구간에서 기준 워드 라인 전압 생성 회로(81)는 이전 구간에서 디스차지된 전압을 미리 설정된 기준 워드라인 전압으로 증가시킨다. 'B2' and the reference word line voltage generation circuit section 81 in the 'b3' section increases, based on a predetermined word line voltage to the voltage charge discharge in the previous section. 'b2' 구간과 'b3' 구간에서 기준 바이어스 전압 생성 회로(85)는 기준 워드 라인 전압의 변화에 따라 미리 설정된 디스차지 레벨로 디스차지된 전압을 미리 설정된 기준 바이어스 전압으로 증가시킨다. 'B2' intervals and 'b3' bias reference voltage generation circuit 85 in the interval is increased by the bias voltage is set to discharge the voltage up to a predetermined discharge level according to a change in the reference word line voltage in advance. 'b1' 구간 내지 'b3' 구간은 메인 워드 라인의 디벨로프 구간과 같은 기준 워드 라인 전압의 디벨로프 구간과 기준 바이어스 전압의 디벨로프 구간을 포함한다. 'B1' interval to 'b3' region comprises a rope section and Development Development rope section of the reference bias voltage of the reference word line voltage, such as the developmental rope section of the main word line. 'b1' 구간 내지 'b3' 구간에서 기준 워드 라인 전압과 기준 바이어스 전압이 미리 설정된 기준 워드 라인 전압과 미리 설정된 기준 바이어스 전압으로 증가된다. 'B1' is increased to a range to 'b3' period based on a word line voltage to the reference bias voltage to the reference bias voltage is pre-set based on the word line voltage and pre-set in. 따라서 'b1' 구간과 'b3' 구간에서 메모리 셀의 데이터 감지가 가능하다. Therefore, the data of the memory cell can be detected in the 'b1' intervals and 'b3' interval. 'c(c1, c2, c3)' 구간은 감지된 데이터의 래치 구간이다. Interval 'c (c1, c2, c3)' is a latch section of the sensed data. 래치 구간은 데이터 감지 구간에 포함되며, 감지된 데이터가 래치되는 구간이다. The latch section is included in the data detection section, an interval the sensed data is latched. 'c' 구간에서 기준 워드 라인 전압 생성 회로(81)는 미리 설정된 기준 워드 라인 전압을 생성하고, 기준 바이어스 전압 생성 회로(85)는 미리 설정된 기준 바이어스 전압을 생성한다. 'C' based on the word line voltage generator in an interval circuit 81 generates a reference word line voltage is pre-set, and the reference bias voltage generation circuit 85 generates a reference bias voltage set in advance. 'd(d1, d2)' 구간은 디스차지 구간이다. 'D (d1, d2)' section is a discharge zone. 디스차지 구간은 데이터 래치가 완료된 시점부터 다음 워드 라인 전압의 인에이블 구간의 시작점까지의 구간이다. The discharge period is a period from the time of the completion of data latch to the next starting point of an enable period of the word line voltage. 'd' 구간에서 기준 워드 라인 전압 생성 회로(81)는 디스차지 회로(90)를 통해 기준 워드 라인 전압을 미리 설정된 디스차지 레벨로 디스차지한다. 'D' based on the word line voltage generator in an interval circuit 81 makes up a disk discharge level previously set based on the word line voltage through a discharge circuit 90. 기준 바이어스 전압 생성 회로(85)는 기준 워드 라인 전압의 디스차지에 따라 디스차지된 기준 바이어스 전압을 생성한다. Based on the bias voltage generation circuit 85 generates a display based on the bias voltage charge according to the discharge voltage of the reference word line. 'e(e1, e2, e3)' 구간은 워드 라인 전압의 인에이블 구간이다. 'E (e1, e2, e3)' interval is an enabled period of the word line voltage. 'e1' 내지 'e3' 구간은 메인 워드 라인 전압들(R1, R2, R3)이 각각 인에이블 되는 구간이다. 'E1' to 'e3' section is the main word line voltage (R1, R2, R3) is the period in which the enable respectively. 각 구간은 메인 워드 라인 전압, 기준 워드 라인 전압, 그리고 기준 바이어스 전압의 디벨로프 구간들을 포함한다. Each leg includes a main word line voltage, the reference wordline voltage and Development rope section of the reference bias voltage. 플래시 메모리 장치에서 메인 워드 라인 전압은 순차적으로 증가한다. Main word line voltage in a flash memory device is increased by one. 디벨로프 구간에서 메모리 셀에 흐르는 전류는 제 1 전류로부터 제 2 전류로 증가한다. Development current flowing through the memory cell in the rope section is increased from the first current to the second current. 제 1 메인 워드 라인 전압(R1)에서 제 2 메인 워드 라인 전압(R2)로 메인 워드 라인 전압이 증가되는 경우를 일예로 설명한다. The first describes a case that the second main word line voltage is increased to the main word line voltage (R2) on the main word line voltage (R1) as an example. 메모리 셀에 흐르는 전류는 디 벨로프 구간 이전에 제 1 전류의 값을 가지고, 디벨로프 구간에서 제 1 전류로부터 제 2 전류까지 증가하게 된다. Current flowing through the memory cell has a value of the first current before the de-envelope section, it is increased from the first current to the second current in the Development rope section. 제 1 전류는 제 2 전류보다 작다. The first current is less than the second current. 감지 증폭기는 기준 바이어스 전압을 사용하여 기준 전류를 발생한다. The sense amplifier is to generate a reference current using the reference bias voltage. 기준 바이어스 전압은 디스차지 구간에서 디스차지되고, 디벨로프 구간에서 디벨로프된다. Based on the bias voltage and the discharge in the discharge region, the rope in Development Development rope section. 기준 전류는 제 2 전류의 값을 유지하지 않고, 기준 바이어스 전압의 디스차지를 통해서 제 1 전류로부터 제 2 전류로 증가한다. The reference current is increased to a second current from the first current does not maintain the value of the second current, through the discharge of the reference bias voltage. 감지 증폭기는 메모리 셀의 전류와 기준 전류가 유사하게 변화함으로서 디벨로프 구간에서도 데이터 감지가 가능하다. The sense amplifier is sensing the data available in the Development rope sections by the current and the reference current of the memory cell changes similarly. 도 5는 도 2에 예시적으로 도시된 기준 바이어스 전압 제공 회로의 다른 구조를 도시한 도면이다. 5 is a view showing another structure of the reference voltage provides a bias circuit illustratively shown in FIG. 도 5를 참조하면, 기준 바이어스 전압 제공 회로(80)는 기준 워드 라인 전압 생성 회로(81), 기준 메모리 셀(83), 기준 바이어스 전압 생성 회로(85)를 포함한다. Figure 5, the reference bias voltage providing circuit 80 includes a reference word line voltage generation circuit 81, a reference memory cell 83, reference bias voltage generating circuit 85. 기준 워드 라인 전압 생성 회로(81)는 기준 워드 라인 전압을 생성하여 기준 메모리 셀(83)의 게이트로 출력한다. Based on the word line voltage generator circuit 81 generates a reference voltage to the word line and outputs it to the gate of the reference memory cell (83). 기준 바이어스 전압 생성 회로(85)는 디스차지 회로(90)를 포함한다. Based on the bias voltage generation circuit 85 includes a discharge circuit 90. 디스차지 회로(90)는 디스차지 제어 신호(DIS_CTRL)에 응답하여 동작하며, 기준 워드 바이어스 전압 생성 회로(85) 를 통해 기준 바이어스 전압을 디스차지 구간에서 디스차지한다. The discharge circuit 90 is operative in response to discharge control signals (DIS_CTRL), make up the display based on the bias voltage via the reference word bias voltage generating circuit 85 in the discharge zone. 디스차지 회로(90)는 복수개의 트랜지스터를 병렬 연결하여 기준 바이어스 전압을 디스차지하도록 구현하거나 미리 설정된 크기의 트랜지스터를 사용하여 기준 바이어스 전압을 디스차지하도록 구현할 수 있다. The discharge circuit 90 may be implemented so as to occupy the standard display bias voltage with the size of the transistor implementation or pre-set to display up to the reference bias voltage to a plurality of parallel connected transistors. 디스차지 회로(90)에 포함된 트랜지스터의 게이트는 기준 바이어스 전압에 의해 제, 드레인은 감지 증폭기에 연결되고, 소스는 접지된다. The gate of the transistor included in the discharge circuit 90 is the drain by the reference bias voltage is connected to the sense amplifier, the source is grounded. 디스차지 회로(90)는 기준 바이어스 전압을 미리 설정된 전압 레벨까지 디스차지한다. The discharge circuit 90 makes up discharge to the voltage level set in advance based on the bias voltage. 한편, 디스차지 구간이 종료되면, 즉 다음 워드 라인 전압 인에이블 구간이 시작되면, 디스차지된 기준 바이어스 전압은 증가하게 된다. On the other hand, if the discharge period has ended, that is, when the word line voltage, and then an enabled period begins, the reference bias voltage up discharge is increased. 기준 바이어스 전압 생성 회로(85)에서 생성된 기준 바이어스 전압은 기준 워드 라인 전압으로 인해서 디스차지 구간을 포함하고, 메인 워드 라인의 디벨로프 구간에서 디벨로프된다. Based on the bias voltage generated by the reference bias-voltage generating circuit 85 is due to the reference word line voltage includes a discharge interval, the rope in Development Development rope section of the main word line. 도 6은 도 5에 예시적으로 도시된 기준 바이어스 전압 제공 회로의 사용에 따른 전압 파형을 도시한 도면이다. 6 is a diagram showing the voltage waveforms associated with the use of the reference bias voltage providing circuit illustratively shown in FIG. 도 6에는 메인 워드 라인 전압, 기준 워드 라인 전압, 및 기준 바이어스 전압이 도시되어 있다. 6 has a main word line voltage, the reference word line voltage, and the reference bias voltage is shown. 메인 워드 라인 전압은 메모리 셀 어레이 내에 포함된 메모리 셀의 워드 라인에 인가되는 워드 라인 전압이다. Main word line voltage is a word line voltage applied to the word lines of the memory cells included in the memory cell array. 기준 워드 라인 전압은 기준 바이어스 전압 생성 회로에 포함된 기준 메모리 셀(83)에 인가되는 워드 라인 전압이다. Based on the word line voltage is a word line voltage applied to the reference memory cell (83) included in the reference-bias-voltage generating circuit. 'a' 구간은 워드 라인 전압의 프리차지 구간이다. 'A' period is a precharge period of the word line voltage. 프리차지 구간에서 메인 워드 라인과 기준 워드 라인은 메인 워드 라인 전압, 및 기준 워드 라인 전압으로 각각프리차지된다. Pre-charge period in the main word lines and the reference word line is pre-occupied with each main word line voltage, and the reference word line voltage. 'b1' 구간에서 기준 워드 라인 전압 생성 회로(81)는 일정 레벨의 전압으로 프리차지된 전압을 미리 설정된 기준 워드 라인 전압으로 증가시킨다. Based on the word line voltages generated by the 'b1' interval circuit 81 increases by a predetermined word line voltage to a precharge voltage to a voltage of a predetermined level. 'b1' 구간에서 기준 바이어스 전압 생성 회로(85)는 기준 워드 라인 전압의 변화에 따라 일정 레벨로 프리차지된 전압을 미리 설정된 기준 바이어스 전압으로 증가시킨다. 'B1' bias reference voltage generation circuit 85 in the interval is increased by the bias voltage is set to the precharge voltage at a constant level according to a change in the reference word line voltage in advance. 'b2' 구간과 'b3' 구간에서 기준 워드 라인 전압 생성 회로(81)는 미리 설정된 기준 워드 라인 전압을 유지한다. 'B2' intervals and 'b3' period based on a word line voltage generator 81 in advance is based on maintaining the word line voltage is set. 'b2' 구간과 'b3' 구간에서 기준 바이어스 전압 생성 회로(85)는 미리 설정된 디스차지 레벨로 디스차지된 전압을 미리 설정된 기준 바이어스 전압으로 증가시킨다. Based on the bias voltage generation circuit 85 in the 'b2' intervals and 'b3' interval increases the discharge voltage up to a predetermined discharge level, based on the bias voltage set in advance. 'b1' 구간 내지 'b3' 구간은 메인 워드 라인의 디벨로프 구간과 같은 기준 바이어스 전압의 디벨로프 구간을 포함한다. 'B1' interval to 'b3' region comprises a rope developmental period of the reference bias voltage, such as the developmental rope section of the main word line. 'e(e1, e2, e3)' 구간은 워드 라인 전압의 인에이블 구간이다. 'E (e1, e2, e3)' interval is an enabled period of the word line voltage. 'e1' 내지 'e3' 구간은 메인 워드 라인 전압들(R1, R2, R3)이 각각 인에이블 되는 구간이다. 'E1' to 'e3' section is the main word line voltage (R1, R2, R3) is the period in which the enable respectively. 각 구간은 메인 워드 라인 전압, 기준 워드 라인 전압, 및 기준 바이어스 전압의 디벨로프 구간들을 포함한다. Each leg includes a main word line voltage, the reference word line voltage, and the reference section of the rope Development bias voltage. 제 1 메인 워드 라인 전압(R1)에서 제 2 메인 워드 라인 전압(R2)로 메인 워드 라인 전압이 증가되는 경우를 일예로 설명한다. The first describes a case that the second main word line voltage is increased to the main word line voltage (R2) on the main word line voltage (R1) as an example. 메모리 셀에 흐르는 전류는 디벨로프 구간 이전에 제 1 전류의 값을 가지고, 디벨로프 구간에서 제 1 전류로부터 제 2 전류까지 증가하게 된다. Current flowing through the memory cell is increased from the values ​​of the first current before the rope developmental period, from the first current in Development rope section to the second current. 제 1 전류는 제 2 전류보다 작다. The first current is less than the second current. 본 발명은 메인 워드 라인의 디벨로프 구간에서도 센싱이 가능함으로서 전체 센싱 구간이 증가하게 된다. The invention is a complete sensing period increases by sensing a possible rope in the Development section of the main word line. 이와 같이 센싱 구간이 증가하면, 플래시 메모리 장치 의 읽기 속도가 향상된다. With this increase, as a sensing period, thereby improving the read speed of a flash memory device. 도 3과 도 5는 기준 바이어스 전압 제공 회로(60)에서 하나의 기준 메모리 셀(83)을 사용하는 경우를 일예로 도시하였으나 R1, R2, R3 전압 각각을 생성하는 3개의 기준 메모리 셀을 사용하여 구성될 수도 있다. And Figure 3 and Figure 5 using a single reference memory cell (83), three reference memory cells, but illustrated as an example produce a R1, R2, R3 voltage each case to use the in the reference bias voltage providing circuit (60) It may be configured. 도 7은 본 발명의 실시예에 따른 노어 플래시 메모리가 일예로 적용된 시스템의 구성을 도시한 도면이다. 7 is a diagram showing a configuration of a NOR flash memory system according to an embodiment of the present invention is applied as an example. 도 7을 참조하면, 시스템(300)은 프로세서 기반의 시스템이고, 제 1 버스(350), 제어부(310)를 포함할 수 있다. 7, the system 300 may include a processor-based system, comprising: a first bus 350, a control unit 310. 제어부(310)는 제 1 버스(350)와 통신한다. Controller 310 communicates with the first bus (350). 제 1 제어부(510)는 마이크로 컨트롤러(micro controller) 또는 적어도 하나의 마이크로프로세서들(micro processors) 또는 디지털 신호 처리부(digital signal processor) 등이 될 수 있다. The first controller 510 may be a microcontroller (micro controller), or at least one microprocessor (micro processors), or digital signal processor (digital signal processor). 시스템(300)은 배터리(380)를 통해서 전원을 공급받을 수 있다. System 300 may be powered by the battery 380. 시스템(300)은 일예로 이동 단말 장치가 될 수 있으며, 이동 단말 장치로 한정되지 않는다. System 300 can be a mobile communication device as an example, not limited to the mobile communication device. 동적 램(DRAM: Dynamic Random Access Memory)(360)은 제 1 버스(350)에 결합될 수 있으며, 시스템 메모리의 기능을 수행한다. Dynamic RAM (DRAM: Dynamic Random Access Memory) (360) may be coupled to first bus 350, it performs the function of the system memory. 시스템이 초기화된 이후, 동적 램(360)은 Windows.RTM과 같은 운영 체체(OS: Operating System)(564)를 저장할 수 있다. After the system is initialized, the dynamic RAM 360 operating as tsetse Windows.RTM: can store (OS Operating System) (564). 입출력(I/O: Input/Output) 장치(320)는 제 1 버스(350)에 결합될 수 있고, 터치 스크린, 디스 플레이, 마우스, 키보드 등과 같은 다양한 장치들을 포함한다. Includes various devices, such as device 320 may be coupled to first bus 350, a touch screen, display, mouse, keyboard: IO (Input / Output I / O). 무선 인터페이스(340)는 제 1 버스(350)에 결합될 수 있다. Wireless interface 340 may be coupled to first bus 350. 무선 인터페이스(340) 는 셀룰러 기능 또는 다른 장치들과의 통신 기능을 수행하게 할 수 있다. Wireless interface 340 may perform a communication function of the cellular function or other device. 일예로, 무선 인터페이스(340)는 다이폴 안테나(dipole antenna)를 포함할 수 있다. As an example, the wireless interface 340 may comprise a dipole antenna (dipole antenna). 시스템(500)은 메모리(370)를 포함할 수 있다. The system 500 may include a memory 370. 메모리(370)에 포함된 플래시 메모리(378)는 내부에 방출 파일 할당 테이블(EFAT: Emulated file allocation table)(80)이 저장될 수 있다. A memory included in the flash memory 370, 378 are assigned discharge file in an internal table: There are to be stored (EFAT Emulated file allocation table) (80). 플래시 메모리(378)는 일예로 노어 플래시 메모리가 될 수 있으며, 본 발명에서 구현된 노어 플래시 메모리가 일예로 적용될 수 있다. Flash memory 378 may be a NOR flash memory as an example, the NOR flash memory implemented in the present invention can be applied as an example. 메모리(370)는 인터페이스(I/F: interface)(330)를 통해 제 1 버스(350)와 연결된다. Memory 370 interface is connected to a first bus 350 via an (I / F interface) (330). 메모리(370)는 제 2 제어부(372), 플래시 메모리(378), 램(RAM: Random access memory)(374)을 포함한다. Memory 370 is a second control unit 372, flash memory 378, RAM: include (RAM Random access memory) (374). 노어 플래시 메모리(378)와 램(374)은 제 2 버스(376)를 통해 제 2 제어부(372)에 연결된다. NOR flash memory 378 and RAM 374 are connected to the second controller 372 through a second bus (376). 노어 플래시 메모리(378)는 방출 파일 할당 테이블을 구현하기 위한 소프트웨어(102, 104, 106)들을 포함한다. NOR flash memory 378 includes software 102, 104, 106 for implementing a file allocation table release. 그러므로, 초기화 시 방출 할당 테이블(200)과 소프트웨어(102, 104, 106)는 램(374)으로부터 실행될 수 있다. Thus, upon initialization discharge allocation table (200) and software (102, 104, 106) it may be executed from the RAM 374. 도 7에서는 본 발명에서 제안된 노어 플래시 메모리 장치가 이동 단말 장치에 적용된 것을 예시적으로 설명한 것이며, 본 발명에서 제안된 노어 플래시 메모리 장치는 이동 단말 장치 이외의 다양한 장치들에 적용될 수 있다. Figure 7 will illustratively described in that a NOR flash memory device proposed by the present invention is applied to a mobile communication device, a NOR flash memory device proposed in the present invention can be applied to various devices other than the mobile communication device. 한편, 본 발명의 상세한 설명에서는 구체적인 실시 예에 관하여 설명하였으나, 본 발명의 범위에서 벗어나지 않는 한도 내에서 여러 가지 변형이 가능함은 물론이다. On the other hand, the invention has been shown and described with respect to specific embodiments, various modifications are possible within the limits that do not depart from the scope of the invention. 그러므로 본 발명의 범위는 상술한 실시 예에 국한되어 정해져서는 안되며 후술하는 특허청구범위뿐만 아니라 이 발명의 특허청구범위와 균등한 것들에 의해 정해져야 한다. While the invention will be defined by the appended claims and equivalents of the invention as well as the claims below should not jeonghaejyeoseo limited to the embodiments described above ones. 상기 제어 회로는 읽기 동작 시 상기 메모리 셀에 인가되는 메인 워드 라인 전압의 변화에 따라 상기 기준 바이어스 전압이 디벨로프되도록 상기 기준 바이어스 전압 제공 회로를 제어하는 플래시 메모리 장치. It said control circuit during a read operation flash memory device for controlling said reference bias voltage providing circuit to the reference bias voltage Development rope in accordance with the change of the main word line voltage to the memory cell. 상기 읽기 동작은 복수의 인에이블 구간들을 포함하고, 상기 각 인에이블 구간 동안 상기 메모리 셀로 메인 워드 라인 전압이 공급되며, 상기 인에이블 구간들 중 적어도 하나는 디스차지 구간을 포함하는 플래시 메모리 장치. The read operation is a flash memory device including a plurality of the enable interval, and wherein the main memory cell word line voltage supply for each of the enable interval, and at least one of the enable interval comprises a discharge section. 상기 디스차지 구간 동안, 상기 제어 회로는 상기 기준 바이어스 전압이 소정 레벨까지 방전되도록 상기 기준 바이어스 전압 제공 회로를 제어하는 플래시 메모리 장치. During the discharge interval, the control circuitry for controlling the flash memory device, the reference bias voltage providing circuit to discharge to a predetermined level, the reference bias voltage. 상기 읽기 동작은 제 1 내지 제 3 인에이블 구간들을 포함하고, 상기 제 1 및 제 2 인에이블 구간들 각각은 상기 디스차지 구간을 포함하는 플래시 메모리 장치. The read operation each of which includes first to third enable interval, and the first and second enable intervals is a flash memory device including the discharge zone. 상기 방전된 기준 바이어스 전압은 상기 디스차지 구간이 종료된 후 다음의 인에이블 구간에서 상기 메인 워드 라인의 변화에 따라 증가되는 플래시 메모리 장치. The discharge reference bias voltage is a flash memory device which is increased in accordance with the change of the main word line in an enabled period of the discharge interval, and then after the ends. 상기 기준 워드 라인 전압 제공 회로는 상기 기준 워드 라인 전압을 상기 디스차지 구간 동안 디스차지하도록 구성된 디스차지 회로를 포함하며, 상기 기준 바 이어스 전압은 상기 기준 워드 라인 전압의 변화에 따라 변화되는 플래시 메모리 장치. The reference provides word line voltage circuit includes a discharge circuit configured to charge discharge during the discharge period of the reference word line voltage, it said reference bias voltage is a flash memory device which changes according to the change of the reference word line voltage . 상기 기준 바이어스 전압 생성 회로는 상기 기준 바이어스 전압을 상기 디스차지 구간 동안 디스차지하도록 구성된 디스차지 회로를 포함하는 플래시 메모리 장치. The reference bias voltage generating circuit is a flash memory device comprising a discharge circuit configured to discharge charge during the discharge interval of the reference bias voltage.